American wildlife photojournalist Tim Laman was named winner of the prestigious annual competition for his image Entwined Lives, showing a critically endangered Bornean orangutan in the Indonesian rainforest. The award is given for a story told in just six images, which are judged on their story-telling power as a whole as well as their individual quality. The images will go on display at the Natural History Museum in London from 21 October, before touring internationally. He observed the animal's behavior, then spent three days using ropes to climb the tree, setting up GoPro cameras that he could trigger remotely. 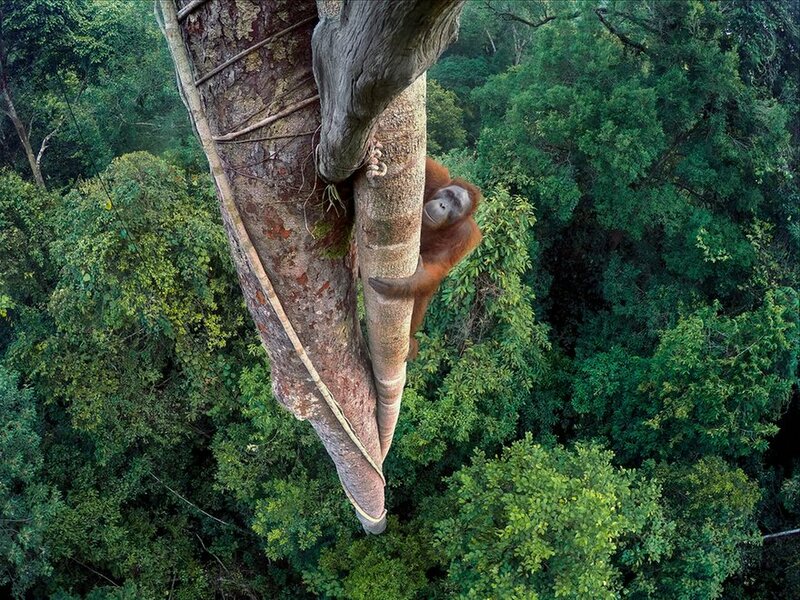 This allowed him to capture the orangutan's face from above, with a wide-angle perspective of the forest below. Wild orangutans face habitat loss from agriculture and logging. This, combined with increased poaching for illegal pet trade, poses huge challenges to the species.